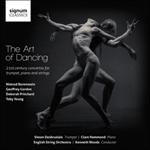 The Art of Dancing is a modern homage to the baroque dance suite. The piece is a set of loose variations or embellishments on the opening prelude—a short arioso based on a pop-song I wrote for a Japanese boy band—with each movement hinting at a different style of electronic dance music. The first movement reflects UK Garage, a quirky dance style based on syncopation and rhythmic instability. The second, 'Acid House', showcases the psychedelic aspect of this drug-fuelled genre, moving into a short interlude recalling the opening prelude, acting as a type of refrain. 'Drum & Bass' presents a fast, virtuosic movement for both soloists, before a hypnotic central nocturne, inspired simultaneously by the hypnotic quality of trance music and Mahler’s famous adagietto from his fifth symphony. The sixth movement is an earthy Totentanz, beginning stately but gradually speeding up into a mad, possessed St Vitus’ dance to the death. A final postlude recalls the opening one last time. In spite (or perhaps because of) this piece’s electronic influences, the orchestration reflects the baroque concerto da camera, with musical material being playfully passed between the two soloists against the body of ripieno strings. As the piece unfolds, there is a suggestion that the trumpet is trying to tempt the piano, leading it astray through a set of elaborate music games. The trumpet often steals the piano’s melodies, becoming more and more dominant—indeed, the trumpet is metaphorically ‘masked’ (i.e. muted) through most of the work, only becoming unmasked to reveal his true identity at the very end of the sixth movement.